Emperors Garden also known as Japan is a ground forces map available in all modes. It was added to the game in Update 1.71 “New E.R.A.”. As the name suggests the map is set in Japan, although the location itself is fictional it is inspired by the landscape and architecture of the Japanese countryside. In general the terrain of the map is rather uneven, with a large number of rocky hills, and dips in the terrain, this can make long range engagements difficult to pull off, with most combat happening at short to medium range. The Northwest of the map is taken up by a small town, made up of traditional Japanese buildings. 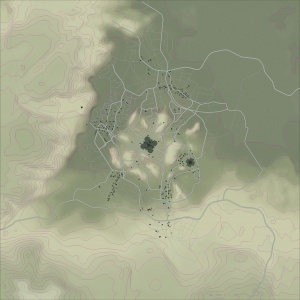 The town is at a lower elevation than most of the map, this means that players can soot down into it from some points in the middle area of the map. The center of the map is taken up by a large temple complex. Battles take place at close quarters, around the main temple buildings; players may also sit on the hills / tree lines, north and south, of the temple and try to shoot enemy tanks within the temple complex. The lower are to the west can be used to flank, but can leave the player exposed to fire from the town, and enemy tanks in the area northwest of the temple. The Southwest of the map is taken up by a smaller temple, and a number of traditional buildings; the area is separated from centre of the map by a large rocky hill. The terrain in this area is rather uneven with several hills and a thick bamboo forest to provide cover. Battles tend to take place at short range in this area. 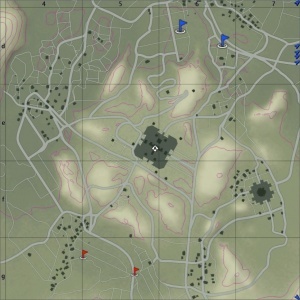 The tank battles map is restricted to 1.6km x 1.6km or 2.4km x 2.km depending on game mode. The air battles area is 64km x 64km. The beautiful rural countryside of Japan, explore the fruitful cherry blossoms to stunning Japanese architecture. The location is fictional, although it was "inspired by the picturesque landscape surrounding Shirakawa village and traditional Japanese architecture". From this it can be inferred that the map is set on the Japanese mainland. Although extensively planned, the invasion of mainland Japan never commenced as the atomic bombings of Hiroshima and Nagasaki led to Japan's surrender, and the end of the Second World War, before an invasion was necessary. There are three Capture Points. Point A is in the northwest village, B is in the main temple complex (centre of the map), C is in the smaller temple in the southeast. This page was last edited on 7 March 2019, at 16:53.